Looking for the perfect stocking stuffer for the holidays? Spread good cheer and a happy new year with the State College Spikes! Purchase a Flex Book from now through December 31 and receive a BONUS voucher, or get a BONUS game of your choice with every Value Plan ordered before the end of the year, along with great savings. The Flex Book does just what the name implies - it provides ultimate flexibility in attending Spikes home games! 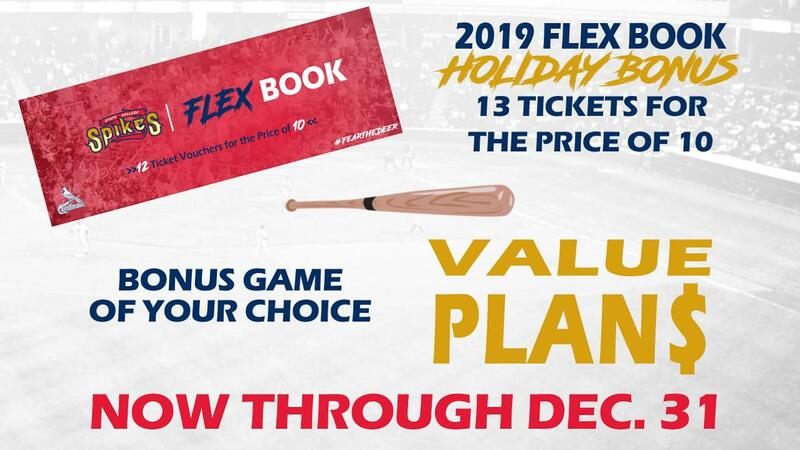 Every Flex Book gives fans 12 undated ticket vouchers for the price of 10, and anyone taking advantage of this holiday deal will get a BONUS 13th voucher, adding even more value to the package! Click here for more info on Flex Books! If you can't commit to a Spikes Season Seat Membership, but still want to enjoy some of the great membership benefits, then one of our four Value Plan options are for you. Choose a Half-Season Plan, Family Fireworks Plan, Mug Club Plan or Five-Game Plan, and receive exclusive amenities. Plus, every Value Plan ordered through December 31 gets a BONUS game of your choice added onto plan as an extra holiday gift! Click here for more info on Value Plans! These offers only last through the end of the year, so to order today, call a Spikes ticket representative at (814) 272-1711.